Charlotte has a busy practice in all areas of family law. She joined chambers after successful completion of her pupillage under the supervision of Harry Gates, Dorothea Gartland and Hassan Khan. She has experience in complex public, private and international children cases, financial matters (including jurisdictional disputes) and proceedings in the Court of Protection. Charlotte has been shortlisted for “Family Law Young Barrister of the Year” in the 2018 LexisNexis Family Law Awards. 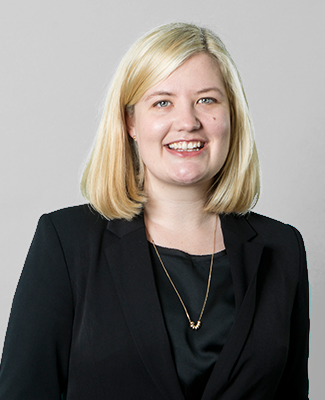 Charlotte recently appeared in the Court of Appeal in Re S (Abduction: 1980 Hague Convention or BIIA)  EWCA Civ 1226, led by Jacqueline Renton, and co-authored, with her, the International Family Law Update (September 2018) for Family Law Week. She appears in the High Court in child abduction matters and represents parents in applications for leave to remove to Hague and non-Hague Convention countries. Charlotte is regularly instructed in complex private law matters, including cases involving internal and international relocations, allegations of domestic abuse, implacable hostility and parental alienation. Along with Hassan Khan, she wrote an article on discrimination, contact and the Family Court following Re M (Ultra-Orthodox Judaism: Transgender)  EWCA Civ 2164 and will be co-presenting a seminar on “Transgender Parents, Discriminatory Practices and the Family Court” at the ICFLPP’s Conference in July 2019. She is particularly interested in surrogacy arrangements, having won the Bar Council’s law reform essay competition: ‘Womb for Improvement: Enforcing Surrogacy Agreements in England and Wales’. Charlotte has been led by Cyrus Larizadeh QC in two complex fact-finding hearings involving catastrophic injuries suffered by infants. She maintains an active public law practice of her own, acting for local authorities, parents and children’s guardians in proceedings involving non-accidental injuries, domestic abuse, substance misuse and mental health problems. Prior to her career at the Bar, Charlotte co-founded Not in my Classroom, an initiative designed to raise awareness of forced marriage in schools. She has delivered workshops for Teach First and has spoken at several conferences on forced marriage, the law and education. In October 2016, she organised the inaugural National Schools’ Conference on Combatting “Honour” Based Violence alongside IKWRO and Youth for Change. She spoke at the Day of Memory in honour of Shafilea Ahmed in 2018, and is currently working with Surrey Fire and Rescue to develop an “honour” based violence safeguarding protocol for their firefighters. In 2014, Charlotte was awarded a Lincoln’s Inn scholarship to undertake a six-month internship at the International Criminal Court in The Hague where she worked in the Trial Division (Chambers) assisting the judges on a number of cases, including: The Prosecutor v. President Kenyatta, Ruto & Sang, Jean-Pierre Bemba Gombo, and Gbagbo & Blé Goudé. Whilst at the ICC, she was the runner-up in the International Children’s Rights Moot organised by UNICEF and Leiden University.